"During the morning and evening peak hours, cyclists represent about 30% of the traffic (370 cyclists per hour), and 20% of the traffic throughout the whole day (7am to 7pm)." Cheapside in the City is undergoing a major refurb. In fact, tomorrow sees the launch of the new mega shopping mall at One New Change. And it's to that end that the City is piling a lot of money into redesigning the street. On paper, it sounds really encouraging. "The existing transport provision and public realm in Cheapside is generally poor. 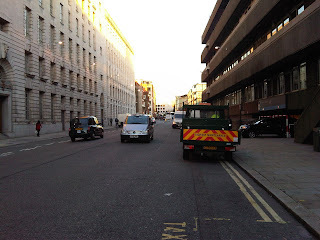 Cheapside has an overly generous carriageway width, which tends to increase the dominance of motor vehicles. This makes the street more dangerous and difficult for pedestrians to cross, and the safety and convenience of the travelling public, especially those in buses and those on pedal cycles, needs to be improved." Wow. We're part of the travelling public. And motor cars aren't. And the road needs to be made more convenient to cycle along. An interesting and encouraging choice of words. Even better, take a look at this list of priorities. In short, I'd agree whole-heartedly with all of this. Reducing the dominance of the motor vehicle is what it's all about. Great. Happy days. We can sit back and watch as pedestrian and cycling magnificence starts to climb out of the backwaters and reassert itself against the dominance of motor vehicles in our cities. 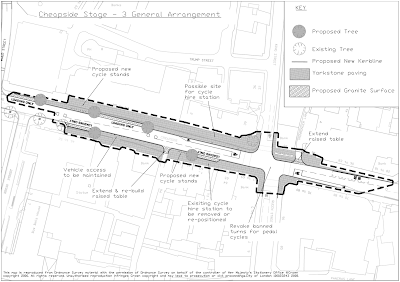 "The proposals would greatly benefit cyclists, the largest single user group of Cheapside. The number of people cycling in Cheapside continues to grow. During the morning and evening peak hours, cyclistsrepresent about 30% of the traffic (370 cyclists per hour), and 20% of the traffic throughout the whole day (7am to 7pm). Given this high number, confining them to a narrow cycle lane does not accommodate them well nor does it address their occasional need to overtake each other. This proposal would limit cycle lanes to the approaches to traffic signals as these help facilitate movement past queuing motor vehicles and is considered to be of high value to people who cycle. Appropriate levels of cycle parking provisions would be incorporated in the scheme." It sounds great, doesn't it? Cyclists are the largest single form of traffic using Cheapside, soon to be one of the busiest high-end shopping streets in the capital. 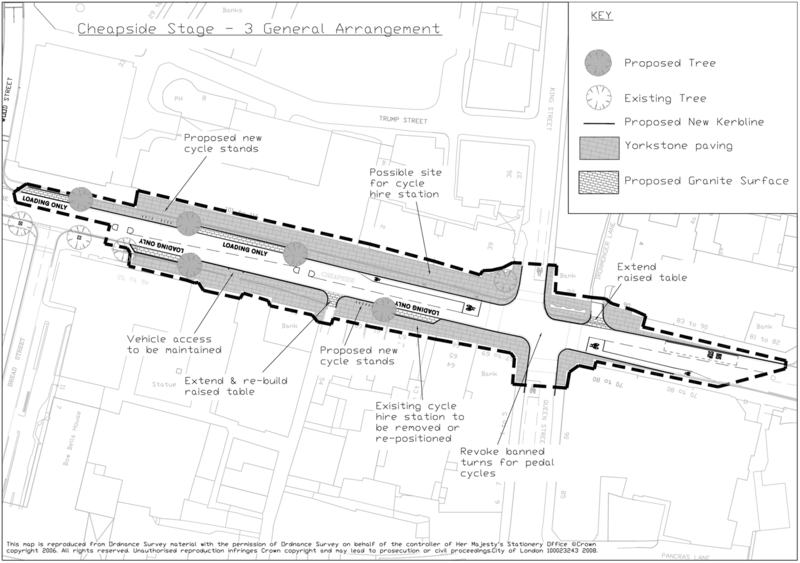 The scheme really considers options for cycling and tries to make the urban realm better for cycling, rather than cars.It will also allow cycles to turn right off Cheapside into Queen Street and on to Southwark Bridge. Currently something that's not permitted. Cycling gets stuck behind the bus on the new Cheapside? But I have nagging doubt it's not quite going to be cycling nirvana. Take a look at the first finished section. Two happy cyclists stuck behind a bus. Why's that then? It's because the lanes are now so narrow, there's nowhere to overtake or undertake the bus. And although I can't find it now, I'm sure I recall that some sections of the new street layout will have a concrete barrier down the centre of the street, preventing cycles or anyone else overtaking on the opposite lane. The same as The Strand, which is hardly cycling nirvana itself. Please tell me I'm being too cynical but look at the layout up at the top of this article. And focus a moment on those pedestrian islands in the middle of the carriageway. And then look at how the road narrows, so that motor vehicles (and I'm thinking buses and delivery lorries to all those stores) basically pull directly in front as you cycle along. The proof will be in the pudding, really. The final scheme sounds brilliant in theory. Motor vehicles tamed. Cycling and walking prioritised. But I'm worried what it really means is a much narrower road space, dangerous pinch points, undertaking spaces at junctions and a wasted opportunity that fails to create a proper cycle space. What's more, there's going to be a sort of displacement effect from this scheme. An extension of the scheme is the St Paul's area project which will see the closure of the coach car park next to the cathedral. The coach parking will be displaced to Queen Victoria Street instead. Queen Victoria Street is a race track with motor vehicles using it to zoom from one end to the other. It's a wide street, with plenty of space for wide, segregated cycling space. But oh no, let's use that space for coach parking instead. You can enjoy cycling between the parked coaches and the traffic instead. Oh, and let's guess what one major attraction of One New Change is going to be? And this is a real winner in competing with the West End: The City of London is a free car parking zone all weekend and evenings. To be fair to One New Change, they don't mention parking anywhere on their website. Yeah - road narrowing + traffic islands = bad idea... There's room for a good, wide cycle lane if you look at the "existing kerb line" - it could even be wide enough for cyclists to overtake each other! Yes exactly. That's all going. I think we'll have a replica of The Strand. Congested with motor vehicles. Nowhere to fit on your bike, let alone overtake. I may be completely wrong. And I hope I am. But it's going to be a real squeeze. Well cheapside is finished now and is a complete disgrace for cyclists. As predicted it is far too narrow leaving cyclists reduced to the virtually stationary speed of the motorised traffic. I now avoid this route as much as possible.